Sarah has been in the dental field for five years. 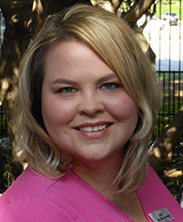 As our front office coordinator, she has the opportunity to meet new patients every day and make them feel welcome. She is originally from Kansas City, MO and together with her husband she has two sons and two Pit bulls. Away from the office, she enjoys crafting and watching her sons play football. Floss only the teeth you want to keep.